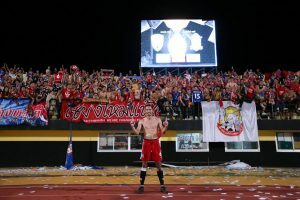 Pictures from the Official Chiang Mai FC page on Facebook. 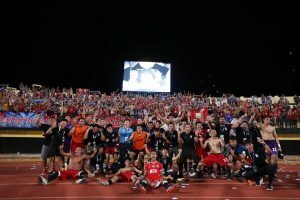 A 2-2 draw at Khon Kaen last night was enough to see Chiang Mai FC promoted to the Thai first division for the first time in the club’s history. 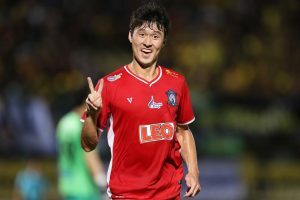 Chiang Mai’s goals came from Soares and Seo Dong-hyeon in the first half. After that it was a case of hanging on for the point. There will be a new team to build for next season. Hopefully coach Carlos will still be here next year and many of the current squad. They deserve a chance at playing in the top league. 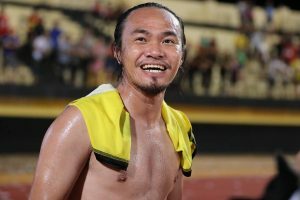 And the passion and commitment of players like Soares, Thossapol and Pichitphong is just great to see. 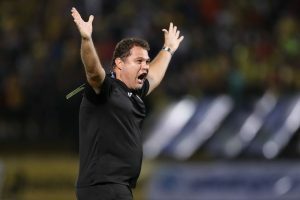 Soares, a Brazilian, a long way from home, in his first season in Thailand. 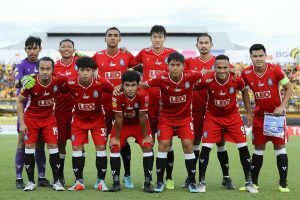 Thossapol and Pichitophong; Thai veterans who give 100% plus in every game. I can almost forgive the dodgy refereeing! since when has eye-gouging been only a yellow-card offence.